Fighting Illini Caravans are coming to a town near you and we want to see you there! Reserve your spot today! Fighting Illini Caravans are coming to a town near you and we want to see you there! It is your chance to meet with administrators, coaches and student-athletes as we crisscross the state and show our team throughout the month of May. From the Fighting Illini family to yours, enjoy a question and answer session, get an autograph and meet other fantastic fans, alumni and friends. Don't miss your chance. Reserve your spot today! 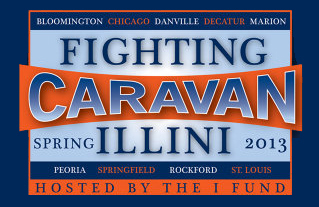 Go to FIGHTINGILLINI.COM/CARAVAN to reserve your spot today and get more information!